If you’re pregnant, you’re at risk for iron deficiency anemia. Why? The amount of red blood cells in your body increase by 20-30%. Total blood volume can increase up to 50%! That requires more iron. You have a disease that affects nutrient absorption like Celiac or Crohn’s disease. In the past, you’ve had heavy periods. You’ve been previously diagnosed with iron deficiency anemia. You’re an athlete who does intense workouts. It makes you feel tired. That’s because much of the iron is in the hemoglobin, which carries oxygen in the body. Because of that important function, iron deficiency can make you feel tired, weak, and can decrease your immune system’s function. Experiencing “brain fog”? This could also be due to iron deficiency. Iron deficiency increases your risk of having a preterm birth and/or a low birthweight baby. Take your prenatal vitamin or a supplement containing 30 mg of iron. A few simple changes can make a difference! Knowing a few things about iron will help improve your iron status, especially if you are anemic. The iron from animal sources (heme iron) is better absorbed than that from plant sources (non-heme iron). Because of this if you are vegetarian, you’ll need about twice as much iron than nonvegetarians or about 48 mg. Non-heme iron absorption is more sensitive to both enhancers and inhibitors, listed below. Non-heme iron is also the type of iron added to fortified foods and supplements. Pay attention to the iron enhancers and inhibitors if you’re vegetarian or tend to be anemic. Meat, poultry and fish. Combining just a small amount of animal protein with vegetarian foods will help you absorb more iron. For example, mix a small amount of natural smoked ham with your pinto beans, or slice some leftover steak into your spinach salad, add some fish to your tofu stir-fry or cook some chicken thighs in your lentil soup,. 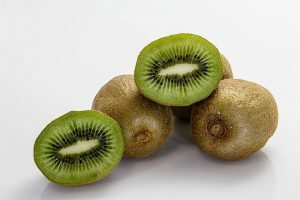 Kiwi is super high in vitamin C.
Eating a food with vitamin C along with food containing iron enhances the absorption of non-heme iron. The effect is greater at the morning meal, with meals that contain whole grains or beans, and with people who are iron deficient. For example, have berries on your bran cereal, have a kiwi, orange, mango, melon, or berries for dessert. Add raw or cooked tomatoes, tomato sauce, tomato juice, broccoli, cabbage, greens, cauliflower, or bell pepper as your veggie. Or, drink a half cup of citrus juice, cranberry, blueberry, vegetable or tomato juice, or vitamin C-fortified apple juice with your meal. Cooking with an iron skillet. You can significantly increase the iron content of food by cooking in a seasoned iron skillet. Most foods will double or triple their iron content when cooked this old-fashioned way. Moist, acidic foods like applesauce, chili and spaghetti sauce can increase their iron content by ten times or more when cooked in an iron skillet! Naturally-fermented foods. Fermented foods—which are preserved by friendly microorganisms—contain organic acids which can also help your body absorb more iron. Examples include traditional soy sauce, tempeh, natto, miso, sauerkraut and sourdough bread. Tea and coffee. Tea and coffee (even decaf) contain tannins and polyphenols that can decrease iron absorption when drunk with meals. If you’re not willing to give those up, have them between rather than with meals, or drink pregnancy-approved herbal teas, such as mint tea. While it’s equally good for you, calcium competes with iron for absorption. It’s mostly a problem however, when we’re talking about supplements. If you take iron supplements, don’t take them with your calcium supplements or with milk. Instead, wash your iron down with some orange or other vitamin C-rich juice, which will increase rather than decrease your iron absorption. Phytates are substances found in many Eating Expectantly Superfoods—like whole grains, dried beans, soy foods, nuts and seeds. However, foods with vitamin C counteract the action of phytate, increasing iron absorption up to 400%. Using fermented soy foods like soy sauce, tempeh, natto, miso also cancels out the inhibitory effect. Chronic antacid use. Use of prescription or over-the-counter medications for heartburn (which frequently contain calcium) can also decrease iron absorption, because stomach acid is needed for absorption of iron. You may need more iron in your diet, and more foods with vitamin C. Let your health care provider know if you are popping antacids frequently—she may be able to prescribe something more effective. Gastric bypass. Iron deficiency is common in women who have had a gastric bypass—especially for those who’ve had the Roux-en-Y procedure. The combination of bypass and increased iron needs of pregnancy can sometimes result in severe iron deficiency that requires intravenous iron replacement. Vitamin B12 and folate, necessary for the production of red blood cells, are also common deficiencies after gastric bypass. Check with your health care provider for the amounts of supplemental vitamins you should be taking. Eating non-food items. Craving clay, dirt or laundry starch? This strange phenomenon called ‘pica’ is thought to be a result of iron deficiency, but eating them can also affect iron absorption. They may also contain heavy metals like lead that compete with iron (and aren’t good for anyone.) Don’t be embarrassed to mention this to your health care provider—she can help you brainstorm about possible causes/solutions. Note: This post contains Amazon Affiliate links. Thanks in advance for contributing to my Girl Scout Cookie Fund! Next Up: Iron Rich Foods–Part Two of this series. « Got Allergies? 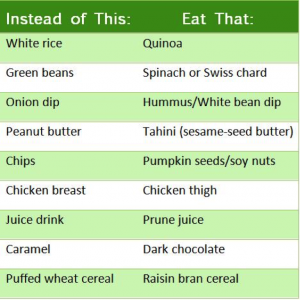 Try these foods! You’ᴠе got wonderful info in this article.